I am in awe at the glory of God, as revealed through His handiwork. 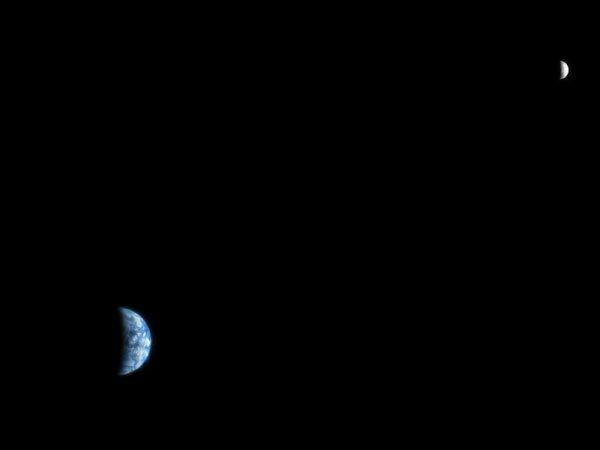 That's the Earth and the moon, as seen from Mars. "I am in awe at the glory of God, as revealed through His handiwork." And with this photo, I could go on and on with the spiritual implications. I mean... the beauty of creation is only visible when reflecting the radiance of the sun (son! ); the earth is suspended and held in orbit by the unseen hand which guides it faithfully through its circuit; the utter darkness that we pass through will be met by light in the morning, so we should have hope in Him who brings that light; etc., etc. How people can look at the vastness of the heavens and not fall in humility and fear at the might of the creator of the universe blows my mind. But as Paul says... to those who are perishing, the cross is such foolishness, but to we who are being saved, it is eternal life. Beauty is only seen by those who are not blind, and only God heals the blind.